Do you have acne? Do you know which type of acne you have or what your skin type is? Many people who have acne fail in their quest to completely stop their acne problem because they do not know the answers to some of the most crucial questions. Blindly, they move on to purchase skin care products that could be wrong for their skin type, are of questionable quality or are only meant to curb a particular type of acne. Luckily, Complete Acne Therapy Solution, Neutrogena is a one-stop solution that is powerful enough to eradicate all traces of acne from your skin. Read on to found out more about what could be the best kept secret to acquiring beautiful skin. Neutrogena is a familiar brand name that has for years worked and successfully earned the peoples trust. This owing to its vast capabilities to help replenish and revamp your skin without the hassle associated with other skin care products. But what are some of the most attractive qualities of the Complete Acne Therapy Solution, Neutrogena? The presence of Benzoyl Peroxide and Salicylic Acid lets you know instantly that this product is credible and reliable. See these are two ingredients that are found extensively in other skin care products as carefully detailed in our recent reviews. Each one of Complete Acne Therapy Solution, Neutrogena products is infused with these ingredients giving you more than enough armor to stop acne for good. Just like colors, acne comes in all kinds of different shaped pimples. Each type of pimple depicts a particular type of acne. Examples of acne pimples include blackheads, whiteheads, papules, pustules, cysts, and so on. However serious your acne, you can depend on Complete Acne Therapy Solution, Neutrogena to help you clear your skin completely. A single package consists of Acne facial cleanser, oil-free moisturizer and acne control lotion. It is recommended that for fast and best results, you use this skin care solution in a particular order. This entails carefully washing your face with the Acne Facial Cleanser. This is meant to remove oil, dirt, and dead skin cells from your face. It contains micro-fine beads that work as a mild exfoliator to remove dead skin and uses and is infused with salicylic acid an active ingredient that makes sure your skin is cleared of all pimples, blemishes, and impurities. Ideal for use during the day, the oil-free moisturizing lotion is made with water-based ingredients and also has sunscreen protection. This makes it very friendly to people experiencing acne accommodating all skin types. It moisturizes your skin to keep it soft and plump and simultaneously protects your skin from the harmful UV rays emitted by the sun. 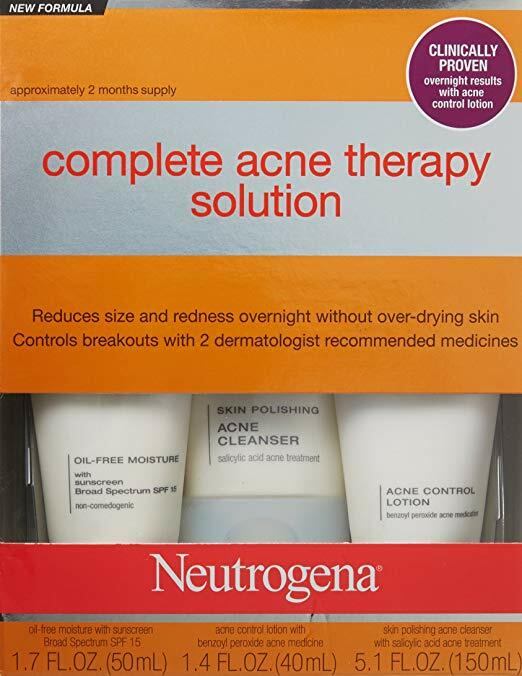 The Complete Acne Therapy Solution, Neutrogena acne control lotion is infused with Benzoyl Peroxide which ensures that no trace of bad bacteria is left on your skin or inside your pores. In addition, this lotion helps reduce pimple size as well as redness as normally witnessed on irritated skin. Dermatologists worldwide often prescribe Complete Acne Therapy Solution, Neutrogena to their patients to treat even the most serious acne cases. This is because since it’s unveiling several years ago, doctors and patients have seen amazing results after consistent use of this skin care product. In just two days of using this product, you will see significant change. The breakout is not so severe anymore, your skin starts clearing, the redness starts to fade away, you don’t feel so itchy anymore, there’s an endless list of changes that you will see. It is easy to assume that once the acne has cleared then this skin care product has done its job. However, the truth is that you continue to reap the rewards with consistent use. Whether or not you have acne, the skin requires constant maintenance in order to remain healthy. Ideal for normal skin, oily skin, dry skin or combination skin. Each one of the three products included in the Complete Acne Therapy Solution, Neutrogena package needs to be used in a particular order and at a certain time of day. For optimum results, it is imperative that you follow the right procedure, failure to do so may slow your acne treatment process. When you are more aware of what your skin type is, what type of acne you are experiencing and the probable causes behind your acne, it then becomes easy to stop acne and maintain your skin in its new, acne-free state. 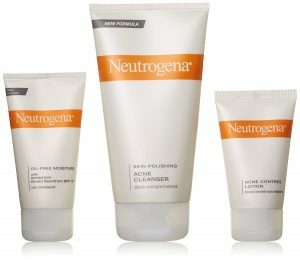 Complete Acne Therapy Solution, Neutrogena is clinically proven as a high quality, highly effective skin care product. Want to know more about skin types, acne pimples, and other credible skin care products? Refer to previous articles.